Big plans are underway for the next Automechanika Shanghai, scheduled for 29 November – 2 December 2017. Each year, the show continues to expand with the scale, exhibitor and visitor figures increasing. Held at the National Exhibition and Convention Center in Puxi, Shanghai, the exhibition space will climb to 330,000 sqm this year, an increase of 7% from last year’s 312,000 sqm. Approximately 6,000 exhibitors from 42 countries and regions are expected to attend this year, which is also an increase of 4% over the 2016 count of 5,756. The number of visitors attending the show is expected to see an 8% increase, with 130,000 from 140 countries and regions. There were 120,671 visitors at the 2016 show. China remains the powerhouse and pivotal driver of the automotive market in the world, with the OE market experiencing a steady ascent. In 2016, the production and sales of automobiles in China grew rapidly and achieved record heights. The production and sales units reached 28.119 million and 28.028 million respectively.In addition, the spare parts production enjoyed a compound annual growth rate of 12.4% from 2011 to 2015 and expected to contribute 38.8% of total auto parts revenue in the world in 2017. The automotive market in the surrounding region is thriving too, Asia-Pacific ranks as the fastest growing market with a compound annual growth rate of 8.3% from 2015 to 2022. This year, key sectors of the show will further expand: Parts & Components sector will occupy one extra hall; Accessories & Customising sector will extend half a hall; while Repair & Maintenance and Electronics & Systems sectors will see a bigger participation from leading companies. In addition, elements of the product categories will be re-defined in an attempt to better reflect the market needs and optimise the visiting experience and efficiency. For example, a new product group of Alternative Drive Systems & Digital Solutions will be added, which encompasses electro-mobility and alternative drives, connected cars and vehicle safety; mobility services and new workshop technologies to duly address the accelerated digital trends within the automobile industry. A new REIFEN zone will be set aside in a new hall delivering a full range of tyre products, equipment and related services. Connected mobility and autonomous driving are the topics of the moment in the automotive industry and are destined to transform not only the automotive world, but also the market impact in China. According to a report by Askci.com, a Chinese publication, the overall adoption rates of connected mobility are progressing faster, with China being no exception. The automobile associations and local industry in China are endorsing and promoting the connected mobility technology. The global market is also on the move. Carmakers, tech firms and OE suppliers are teaming up to claim a share in the market, such as the recent collaborations between AT&T, Delphi and Ford, ZF and NVIDIA, Nexteer and Continental, etc. Falling within the Electronics & Systems sector, the specialised zone of Connectivity, which was introduced during the 2016 show, will be further enhanced and enlarged with a bigger display. More exhibitors will be encompassed in this zone and will be bringing a full spectrum of products, technologies and knowledge to the show. The advancements in the connected mobility realm also increase penetration and crossover into other automotive sectors, including the three other main industry sectors: Parts & Components, Repair & Maintenance and Accessories & Customising. The inflow of smart technology and connectivity in the automotive industry also transforms diagnostic and repair processes, by which data can be sent directly from the car to workshop and more sophisticated testing equipment and data-driven services are required. A myriad of solutions including new workshop technologies, IT management solutions for fleet, workshops and dealerships will be showcased. The E-mobility and Infrastructure zone will see a bigger participation this year, with exhibitors and research institutes gathering from around the world. A wider range of E-mobility solutions ranging from electro-mobility and alternative drive systems, charging infrastructure, battery technology and power electronics to lightweight construction will be on display. There will be special showcases to demonstrate the new inventions of e-mobility as a result of Industry – Academia – Research collaborations. A new co-located zone, REIFEN will make its debut at Automechanika Shanghai 2017. REIFEN is the world’s leading trade fair for the tyre sector and this is an important partnership for Automechanika Shanghai as the world’s second largest Automechanika show. As both tyre businesses and car dealerships are now offering crossover services, this is an advantageous collaboration. The REIFEN zone will include a comprehensive range of high-quality tyres and tyre-related products, including wheels and wheel rims, tyre repair, used tyres, tyre management and systems, sales equipment and tyre storage solutions. This greatly expands the current spectrum of products available at Automechanika Shanghai. It also attracts a new demographic of both exhibitors and visitors to the show. Automechanika Shanghai leverages its extensive resources through Messe Frankfurt’s worldwide network and receives unwavering support from 43 international supporters and associations. 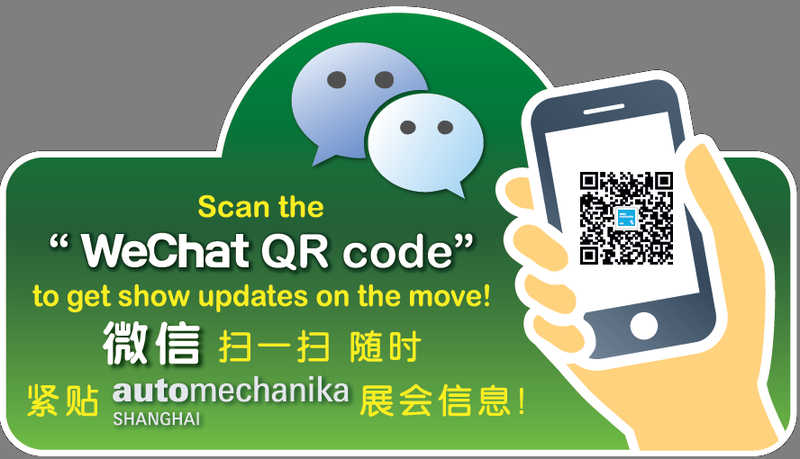 With this support and exposure Automechanika Shanghai 2017 has already received an overwhelming response in booth reservations from key players. Reputable auto parts companies such as Schaeffler and ZF have already confirmed a bigger participation space while others such as ContiTech, Corteco, Dayco, Federal Mogul, Mahle, MANN+HUMMEL, NGK, SDS, Tec Alliance and Valvoline will return. Automechanika Shanghai is organised by Messe Frankfurt (Shanghai) Co Ltd and the China National Machinery Industry International Co Ltd (Sinomachint). It is one of 17 Automechanika fairs held in Africa, Asia, Europe and North, Central and South America. For further information about the Shanghai show, please visit www.automechanika-shanghai.com or contact Messe Frankfurt (HK) Ltd, +852 2802 7728 / auto@hongkong.messefrankfurt.com. Comprising an area of 592,127 square metres, Messe Frankfurt’s exhibition grounds are home to 10 exhibition halls. The company also operates two congress centres. The historic Festhalle, one of the most popular venues in Germany, plays host to events of all kinds. Messe Frankfurt is publicly owned, with the City of Frankfurt holding 60 percent and the State of Hesse 40 percent. For more information, please visit our website at www.messefrankfurt.com. "2016年汽车工业经济运行情况”, 12 Jan 2017. China Association of Automobile Manufacturers. www.caam.org.cn/xiehuidongtai/20170112/1505203997.html. Retrieved 22 Feb 2017. “2017年全球汽车零部件市场规模、中国营业额及出口额预测分析” , 3 Jan 2017. http://www.chyxx.com/industry/201701/483345.html, retrieved 22 Feb 2017. “Growing Global Vehicle Fleet & Rising Average Age of Vehicles Drive the Automotive Aftermarket ”, February 2017. Global Industry Analysts, Inc. http://www.strategyr.com/MarketResearch/Automotive_Aftermarket_Market_Trends.asp. Retrieved 30 March 2017. “2016年中国汽车产销量及2017年车市发展趋”, 8 December 2016. www.askci.com/news/dxf/20161208/15125681754_2.shtml. Retrieved on 27 March 2017. “CES 2017 - list of world debuts”, 6 Janurary 2017. www.just-auto.com/news/ces-2017-list-of-world-debuts_id172973.aspx. Retrieved on 27 March 2017.